Eaton's method predicts pore pressure from either velocity or resistivity, using equations shown in Figure 3 (see Eaton's Equation). These both require a normal compaction trend line (NCTL) and overburden pressure (OBP), which may be well-local or regional models. The Observed Shale Compaction Trend Line (OSCTL) is the smoothed log response from which pore pressure is predicted. Set hydrostatic pressure gradient - Under Eaton, Hydrostatic Pore Pressure Gradient (ppg), enter the desired gradient. The default is 8.5 ppg, which is widely used, but depends on salinity and temperature. For PPP from logs, the shale zones must be isolated in order to only utilise sonic (or resistivity) points which sample shale. These log values define the Observed Shale Compaction Trend Line (OSCTL). Right click on the Shale Indicator track to Start picking Shale Cutoff. 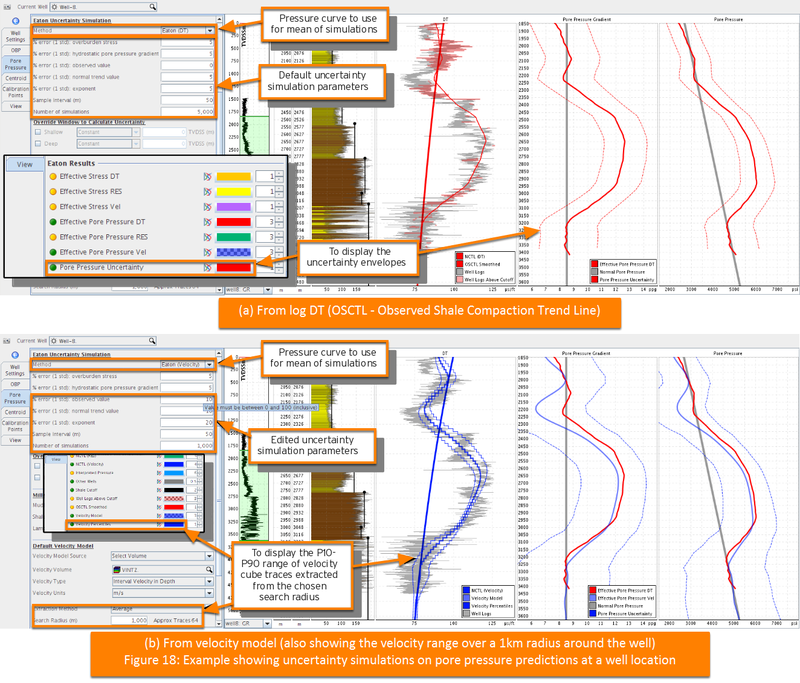 Click at multiple depths and indicator values to define the shale zones. You can pick multiple separate thresholds, and move them individually, to create a varying cutoff along the well. Only values above the selected thresholds are used in the OSCTL definition. The P-sonic and resistivity logs above the shale cutoff are smoothed to define the OSCTL. The default is 200m vertically. Note: The smoothing parameters can be overridden for a particular well under the Well tab. Figure 15 shows the locations for setting the hydrostatic gradient and default OSCTL smoothing windows (left side). 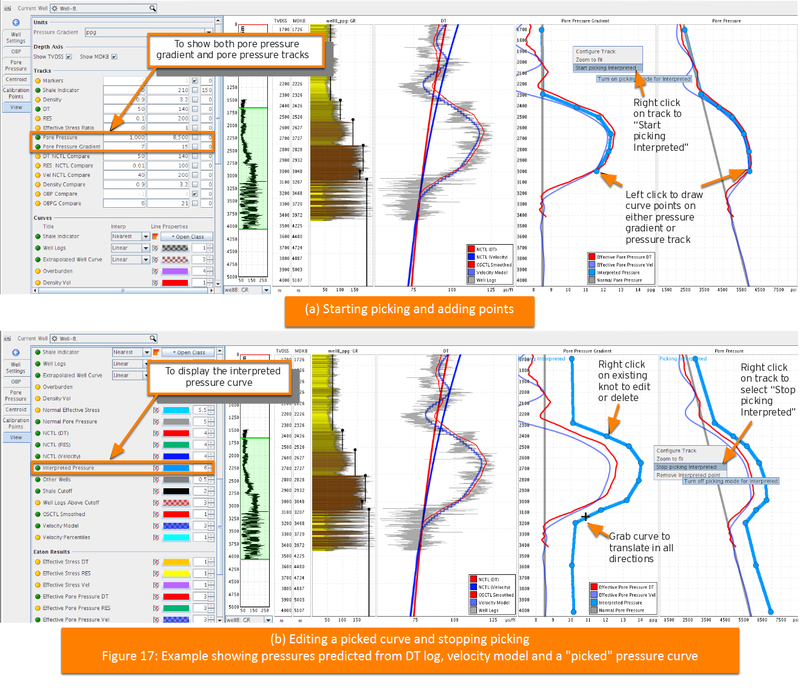 On the right, it shows example picked shale zones, and how that affects the logs above this cutoff (DT and RES). Once again, the Eaton pore pressure curves from the OSCTL (DT and/or RES) can be enabled in the View tab (Figure 16). Note: The default smoothing and Eaton parameters may be overridden for a particular well in the Well Settings tab. You will need to settle on a common value for these (and an NCTL function) when you create a 3D pore pressure model, discussed in 3D Model Buildiing. Velocity model - If a seismic velocity volume is available, this may be used for predictions away from the borehole, and/or ahead of the drill bit (where no wireline data is logged). This will use global NCTL and OBP models. The relevant 1D well location calibration / 3D model building workflow and QCs are outlined in more detail in 3D Model Building. Interpreted pressure - A pore pressure curve may be picked at a well location, based on the predicted pressures (from either the Eaton or Miller methods) and/or other calibration points (see Calibration Points for more detail). To manually interpret a pressure curve, on either the pore pressure gradient or pore pressure tracks, right-click to choose Start picking Interpreted. Left-click to add a point, right-click to remove a point, or left-click and hold to drag the picked curve. Figure 17 shows an example of a manually-picked curve. The PPP module can perform a stochastic simulation using all of the variables of Eaton's method, at the well location. This will indicate the uncertainty envelope around the deterministic (most likely) value. First, a pore pressure gradient (PPG) curve is calculated using Eaton's method, thus defining the deterministic value of PPG. Then, at each depth level, a normal distribution is defined for each input to the Eaton equation (namely overburden stress, hydrostatic pore pressure gradient, observed value, normal trend value, and the exponent). These normal distributions are defined using the most-likely value above, and a user-defined standard deviation for each input. We then randomly sample (using Monte Carlo simulation) from the distributions to create realisations of PPG at each depth level. The P10 and P90 curves are then calculated from this resulting distribution (which may or may not be a normal distribution). Under the Pore Pressure tab, Eaton Uncertainty Simulation section, relative uncertainties can be set for all Eaton parameters (equations shown in Figure 3). The specified Number of random simulations are then made at the given Sample Interval. Figure 18 shows the PPP uncertainty envelopes from both a log sonic and seismic velocity model analysis. Figure 18(a) shows the PPP envelope from the default uncertainty parameters. The envelope on the velocity model from traces extracted in a radius around the well location is shown in Figure 18(b), which is used to set the higher % error on the simulation value. The PPP uncertainty is least sensitive to the Eaton exponent. Calibration Points section shows how to load calibration points to verify the predicted pressures. Less than the mud weight (if well is drilled overbalanced).